Acctivate communicates with QuickBooks using a synchronization process that is performed within Acctivate from the QuickBooks menu. This process is initiated manually via the QuickBooks menu (QuickBooks > Synchronize with QuickBooks) or by utilizing Synchronize button on your icon bar. Most companies synchronize once a day, but it can be done multiple times depending on the need to pass information between programs. The synchronization process requires that QuickBooks exist on the same machine as Acctivate. It does not require that all users exit either software program nor does it require QuickBooks to be in single user mode. 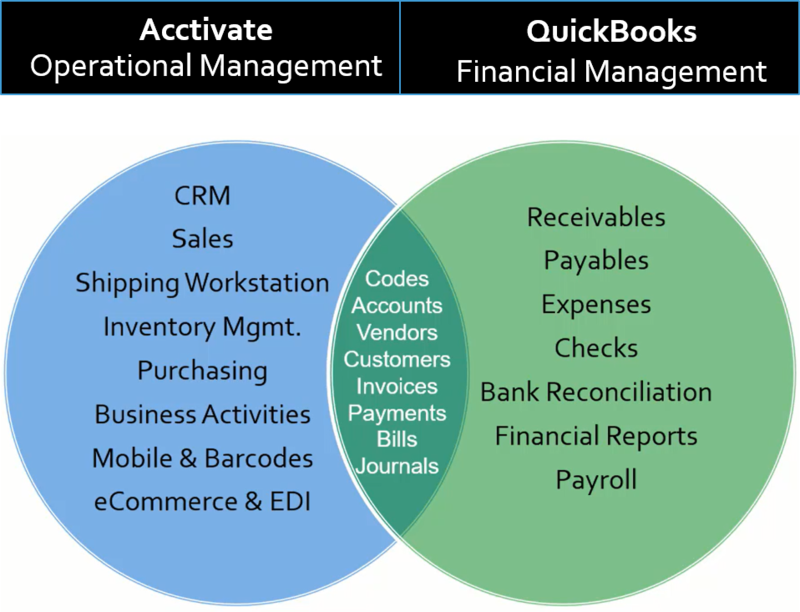 Below you will find a summary of the interface between QuickBooks and Acctivate and the transactions that will be handled by each program. You will be able to test this functionality with the Model Company. To view the complete archive of QuickBooks and Sync articles, click here. Acctivate synchronizes many lists from QuickBooks on an on-going basis. Some are fully maintained in QuickBooks while others can be modified in either program. Customers can be added or updated in either program. Due to required and optional fields in Acctivate, it is suggested that new Customers be added in Acctivate. Vendors are added and updated in QuickBooks. Vendor pricing, Vendor Product IDs, and Lead Times are handled on the Product screen in Acctivate. Salespeople must be setup in QuickBooks, however you may mark them as active/inactive in Acctivate. Terms codes, Chart of Accounts and Payment Types must be setup and maintained in QuickBooks. Acctivate will see any changes after a synchronization. Sales Tax Codes and groups must be setup and maintained in QuickBooks. Once integrated with QuickBooks, Acctivate takes responsibility for all Inventory Management. Journal Entries use specific GL Accounts based on your setup in Configuration Management and reflect the type of transaction posted in the Memo. Sales Invoices will reference the Product Class assigned to the products in your inventory. Therefore, you will see the Product Class list in your Item List in QuickBooks. The items will be deactivated during the create company process and not referenced again. Vendor Bills created via the synchronization process will show details on the Expenses tab in QuickBooks. You’ll see the Warehouse GL Account and the Acctivate Product Description. When Acctivate is first connected to QuickBooks, all of the active items are copied to Acctivate, including the quantity on hand and value. This process marks all items as inactive and adjusts the quantities to zero in QuickBooks. The initial balances are created in Acctivate via a Balance Adjustment. After that, inventory products and quantities are not synced from QuickBooks. Instead, you’ll see journal entries utilizing the Warehouse GL accounts for posted transactions. Any transactions that affect inventory, including transactions to the Inventory asset account, must be handled in Acctivate to ensure that Acctivate and QuickBooks are kept in balance. Acctivate only synchronizes Sales Invoices with QuickBooks. Sales Orders will need to be referenced within Acctivate rather than in QuickBooks. When going Live with Acctivate, open Sales Orders in QuickBooks can be copied into Acctivate, per your preference. Please discuss this with your Project Manager. Acctivate Sales Orders will be released for invoicing when ready. This action will remove the stock from Inventory and bill the Customer. At the time of your next synchronization the newly created Invoice will be sent to QuickBooks Accounts Receivable. Payments that are entered with the Sales Invoice will be sent to the QuickBooks Undeposited Funds account during the Invoice synchronization. If you are shipping Orders without pre-payment, then your Payments should be entered directly into QuickBooks and applied against the Acctivate Invoices. When going Live with Acctivate, Purchase Orders in QuickBooks will not be copied into Acctivate. Open POs must be re-entered into Acctivate. When Inventory is received into your warehouse, enter the Receipt in Acctivate against the Purchase Order using the Inventory Receipt function. When the Vendor Bill is received, enter this in Acctivate using the Purchase Invoice function. This function is a matching of the Vendor Bill to the Purchase Order and Receipt. Once you have supplied the needed information you will create the invoice. At the time of your next synchronization, the Invoice will be sent to QuickBooks and placed in the Bills to Pay section. Vendor Bills that are not related to Purchase Orders are entered directly into QuickBooks.